You just can’t seem to talk to each other without one or both of you getting upset. And this “upset” shows up in all kinds of different ways with you and your partner. Whatever happens, the end result is usually the same–you feel more distant from each other and you don’t feel connected. If this goes on for any length of time, it may even end the relationship. “I’ve been reading your emails for about 4 years now and I just love them. I have a real problem right now in my relationship I’d like some help with. Things used to be great between me and my husband but now it seems like we can’t even talk to each other without one or both of us getting really upset. I mean… we still really love each other but I just don’t know what to do anymore. First of all thanks for hanging in there with us and for reading our emails for 4 years. That’s great but your situation and your communication challenges don’t sound so great. So we’ll give you some ideas to help you shift your situation and help you create more of what you want with your man. The two of us have certainly looked at communication challenges from a lot of different angles–to not only help people like you but quite honestly, to help us keep our relationship close and connected as the years go by. The two of us do a pretty good job of staying connected and believe us when we say, it works when you pay attention to how you’re communicating (or not) and then take steps toward learning how to actually do it–communicate, that is. Okay, so if you can’t talk to one another without arguments, misunderstandings, anger, defensiveness and withdrawing–what do you do? How do you get back the closeness and connection? How to you stop the upsets and fights? 1. Learn what your particular communication style is and why other people are challenged at times by your style. This is certainly not making you wrong or laying blame on you. It’s just that you have to start with you and you starts by paying attention to what complaints other people tell you they have with how you communicate. For instance, you might be a “linear” type man or woman and once you start on your “story” or explanation, you don’t want to be interrupted. But what the other person can feel is that he or she is being “talked to” and there’s no connection. Or…your style might be to not say a whole lot or be very careful when you do because you just don’t want to rock the boat. You might be wary to say what you are really thinking so you hold back and just agree or keep silent. 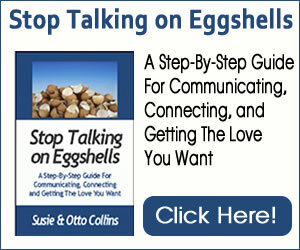 We created “Stop Talking on Eggshells” in part to work out ways for the two of us to use when we have challenges speaking our truth and being understood. If saying what’s on your mind and creating boundaries in a clear, loving way is something you want to learn how to do, you’ll want to download our “Stop Talking On Eggshells” program and go through it as soon as you can. As we just said, we all have different communication styles and whatever your particular communication style is–write it down. Also write down your challenges with others and what people have said you do “wrong” as far as communication is concerned. 2. Don’t make the other person’s communication style wrong but find places you can meet and grow together. Don’t make the other person wrong! And that’s a big lesson when it comes to communication. Susie can jump from one topic to the next (the typical feminine talent for multi-tasking) but Otto wants to stay on one topic until it’s completed (a typical male talent for laser-like focus until completion). Talk about creating situations that are frustrating for both of us! Now we could make each other wrong–or we could open to understanding each other and our “natural” inclinations. In fact, the very health of our relationship has depended in a large part on us taking steps to understand each other. And it starts with not making each other wrong. In understanding, it doesn’t mean that we give over our power or collapse into the other person’s way. It just means that we open to understanding and finding ways to come together–as well as making some agreements that help us do that. One of our agreements is that Susie will ask Otto before she launches into another topic if he’s ready to switch gears or not. He tunes in to see if he needs completion and if not, we go onto another topic. Making our habitual, unconscious ways of communicating conscious–and not making each other wrong–can go a long way toward deepening love and connection. 3. Make the switch in your mind to communicate to connect. Okay, so we know that communicating to connect is easy to say but when you don’t have a clue how to do it, it’s not so easy. The first thing to do is to breathe and stop what you normally do to turn off communication. We’re guessing that when communication doesn’t work for you, you’re not in a heart space. So when you feel your old pattern coming up again, bring your attention to your heart. See your communication as a flow between you and the other person and not just a “one-way street.”–you to them. When you see this flow from your heart, you can be more open to each other. We created “Magic Relationship Words” to help you find words and the intention behind those words that would pave the way for understanding and connecting with each other. This woman “got it” that her communication style–or the words she typically used and the way she said them–put her male friend on the defensive which always stops communication in its tracks and puts up huge walls between people. We invite you to take an objective look at why you can’t talk to one another and then take some positive steps to start opening and connecting. Communication doesn’t have to be hard. It just needs to be about connection.